Nearly 40 businesses have set roots at Brooks. With 350 acres of undeveloped land and many redevelopment opportunities available on campus, there’s room for your business to start its next chapter. Brooks is a community where more than 3,200 people live, work, learn, play, and stay. You can do it all at Brooks. Brooks is overflowing with economic possibilities. Formerly an Air Force Base, Brooks is now an open community with a mission to benefit the economic development and preserve our rich history. Now home to more than 40 businesses, the Brooks region is predicted to support more than 17,000 direct and indirect jobs by 2021. Brooks is located on the South Side of San Antonio, Texas, just minutes from downtown and the beautiful San Antonio River. You can find us south of S.E. Military and west of I-37. Brooks started with 1,308 acres and currently has 350 acres available for development. The time is now to make your move and claim available space for retail, office, build-to-suit, academic, light industrial, manufacturing, and mixed-use developments. Brooks is the ideal location for us to establish our presence west of the Mississippi River. San Antonio has an industrious and enthusiastic workforce that we’ll tap into to help support our growth and meet the increasing demand for our restaurant-quality products. Now is the time to invest in San Antonio and the rapidly developing community at Brooks. The opportunities that exist at Brooks are unbelievable, there is great potential for what we can do. The Southside of San Antonio has been rapidly expanding and we are thrilled to be joining this growing community at Brooks. We are thrilled to be bringing another new development to the Brooks area. We have determined that Texas, in particular, San Antonio, shares OKIN’s values with which we will together usher in continued growth. San Antonio is centrally located between North, Central and South America, which are key markets for our future and Texas is ranked #1 in the U.S. with a total of about 77,000 workers in the plastic industry. This hotel [at Brooks] is a great opportunity for us to get in on the ground floor of a region that’s poised for phenomenal growth. Like our other properties, this will be a top-notch operation and we are confident it will be a great success. Choosing Brooks for your business is a big step. Here’s why it’s worth it. The campus is exempt from property tax as long as Brooks retains fee simple title to the property. We work with clients to develop projects that take maximum advantage of this benefit. As the owner and developer, Brooks can structure project financing in a variety of ways, ensuring a project structure that makes the most financial sense for our clients. The Brooks Board of Directors has legislative authority over development on the property. The result is a streamlined approach to procurement and the ability to accelerate project development schedules. Brooks offers over 350 acres of undeveloped land and many redevelopment opportunities available on campus. San Antonio ­is the only large city in the U.S. with a AAA bond rating. With its diverse culture, beautiful weather, low business costs, and skilled workforce, San Antonio is a thriving economic engine. The median resident age is 32.7. San Antonio is the 7th largest city in the nation and was recognized as the #1 City for Economic Growth Potential by Business Facilities. The Brooks design and development standards create a clear strategy for development on the campus, which gives an added layer of confidence to new project development. When you work at a business located at Brooks, life outside of your job is full and fun. Brand-new apartment complexes offer comfort and style for every budget, while local restaurants and nightlife provide entertainment after a day’s work. Scenic green spaces, like The Greenline, make it easy to enjoy San Antonio’s 300 days of sunshine each year. Employees at Brooks businesses are confident knowing their children are receiving top notch education at the local schools that service Pre-K through medical school students. As the home of the former Brooks Air Force Base, Brooks has a history of greatness. Many of the buildings and monuments from those days are still being honored with strategic adaptive use renovations, such as Hangar 9. 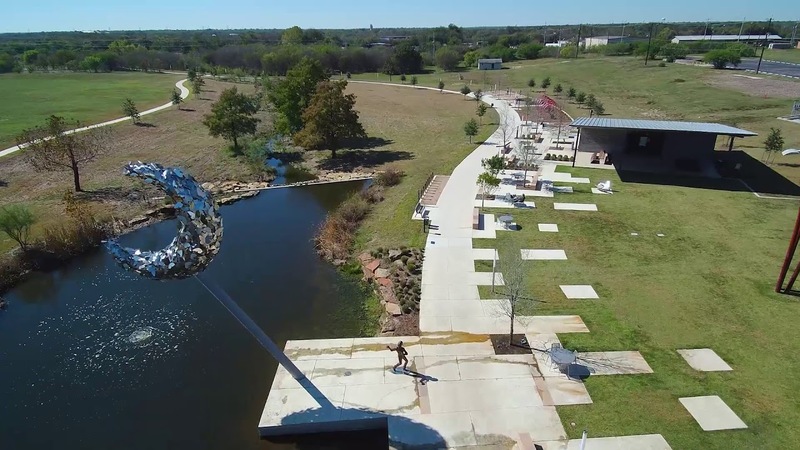 The Brooks area also has roots from the days of settlement that residents and visitors can experience firsthand with a journey down the Mission Reach. Brooks is proud to be part of San Antonio’s vibrant South Side community. Outside of Brooks’ boundaries you will find everything you need to live the life you want, from conveniently located retail shopping and national culinary favorites to fitness centers for all levels and beautiful outdoor parks and trails. We made great strides in the economic development of this area between 2003 and 2018, and there’s still much more to come.